Contemporary Fiction and a fun beach audiobook! Includes Ten Short Stories set in Kokomo's Cafe. This is a short story based in Flagger Beach, Florida about the comings and goings surrounding a local Kokomo Cafe This book has several shorter stories in it all about characters that visit the Kokomo Cafe. This is a quirky little story based in Flagger Beach, Florida about the comings and goings surrounding a local Kokomo Cafe. Have you ever thought about the stories a Cafe owner could tell or even any local tourist business? This book has several shorter stories in it all about characters that visit the Kokomo Cafe. The author, Armand Rosamilia did a good job writing this book which got my attention from the start. The narrator, Jack de Golia did a great job delivering this book to us with all his different voices, accents and emotions. Good job guys! It was interesting meeting so many characters and hearing their stories! I very much enjoyed! 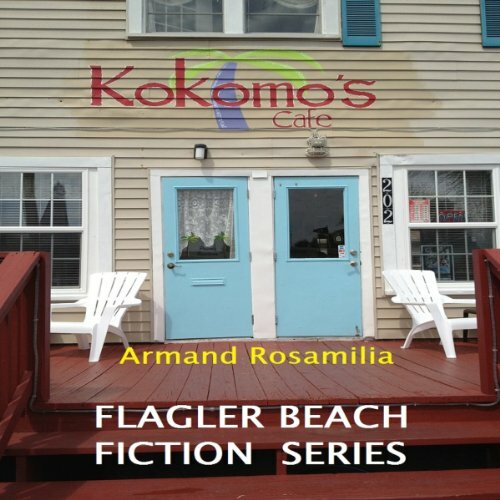 A fun series of short stories set around Kokomo’s Café in Flagler Beach FL. The characters are fun and interesting and the stories take you to the beach no matter where you are. If you’re looking for a short little escape this might just be your tonic. At first I really didn't like the narration but he kind of grew on be after a while. In the end its not the best but not the worst. It doesn't take away my enjoyment of the story nor add to it. If you could sum up Kokomo's Café? Complete in three words, what would they be? What was one of the most memorable moments of Kokomo's Café? Complete? I love the character Ike,Jeb and his dad learned a lesson the hard way. I also like the story of the Motorcycle guys and the lesson it teaches about "Don't judge a book by it's cover." The Collectic and sometimes Eccentric residence of Flagler Beach Fl. This is a feel good book, the character's were entertaining and funny at times.I liked how Armand even included himself as the creepy dude in the Cafe writing.Armand is a brilliant writer,he describes the place so well, it makes you want to take a trip to Flaglers Beach.Stop into Kokomo's Cafe to eat,see Mac and Jen.Hopefully not run into the Realter Beverly.All the characters were fun to observe. I enjoyed this fast read .The story is set in a cafe in a beach town.We get to meet the owners and customers who frequent the place.I WAS hoping for more beachy fun,maybe in the next book.It is narrated by Jack de Golla,who did a fine job with character voices.I do plan on reading the next book in this series. What did you love best about Kokomo's Café? Complete? I've been reading so much fantastical fiction lately that an excursion into something more contemporary is always welcome. Kind of a palette cleanser. With Kokomo's Cafe, I wound up listening to an overall leisurely day with a cast of odd and eccentric characters, that may not have been exciting but was never boring. It seemed like a good enough cap on what was a day's worth of visits to the cafe from an increasingly wild cast of characters in such a bucolic setting. Nothing earth-shattering, just enough to bring things around to almost full circle. And a neat wink-and-nod to how the stories came about. Hadn't heard Jack's performances before, but following this I listened to his work on Michael Laimo's horror novel, Fires Rising, and found he did just as well with some starkly different subject matter. That said, I found his voice best suited to this touching and humorous range of stories, as opposed to the taut and graphic horror fiction. Not necessarily. While the book is short enough that I very well could have spent an afternoon devouring the whole thing, the fact it was a series of loosely connected stories with a shared setting, I could sit in for a half-hour or so at a time and enjoy the audiobook over an entire weekend. While Armand Rosamilia might be best known for writing zombie fiction, this collection of contemporary tales was my first chance to read his work. A good first impression that has me wondering how he ramps up the action, when a quaint assortment of stories here included one serious knockdown, dragout brawl in the middle of the book. I really enjoyed all of the characters Mr. de Golia was about to create. He kept me interested in the stories. I have listened to other stories that Mr. de Golia has read and he did another great job here. I enjoyed the last story the best as Max was closing for the day. The reflection of the day was nice. Also, I enjoyed the author's note explaining the book and how it came to be. I would love to listen to the next books in the series. I want to see what happens next. This collection of short stories take place in one day at Kokomo's Cafe. We learn about many of the customers who come and what their lives are about. It was a snapshot look at each of these people. I would recommend this book to my friends who like short stories or a collection of stories that revolve around one group or subject.